What are solar thermal systems? Solar thermal systems are systems which use solar collectors to harness the free natural energy provided by the sun and convert it into power. Adding a solar thermal system to your heating system will provide you with domestic hot water heating backup and central heating backup. In doing so, you will be able to look forward to lower energy consumption and in turn, lower monthly energy bills. Solar thermal systems work by collecting energy from the sun using solar collectors on the roof of your property and transferring this energy into heat. This is achieved by using the sun’s rays to heat a fluid mixture of water and anti-freeze. The heated fluid mixture is then pumped to a heat exchanger in your home’s water tank and used to heat the water contained within the tank. Once the heat has been released from the fluid mixture, it is then pumped back to the collectors for reheating. What do I need for a solar thermal system? What is the difference between a flat plate collector and a tube collector? Flat plates can be integrated into the roof your property and can be coloured coded to match your roof tiles. Cheaper to install than tube collectors, they are the ideal solution for south facing pitched roofs. Tube collectors offer greater efficiency and increased flexibility as they can be rotated to face the sun. Tube collectors are suitable for installation on pitched roofs, flat roofs and on walls. Tube systems can also be easier to install as the individual tubes can be installed separately. What are flat plate collectors made from? Our range of Vitosol flat plate collectors are made from light and translucent anti-reflex glass. With long term durability and reliability, they also feature a seamless edge strip for weather and UV resistance. Is there enough sunshine for solar thermal systems in the UK? Whilst the UK does not benefit from all-year round sunshine, there is enough sunshine available for domestic hot water, as our solar thermal systems will work in cloudy and overcast weather. What happens when the sun doesn’t provide enough heat? 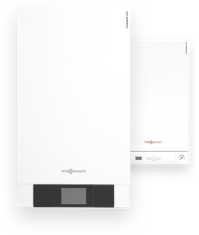 With a Viessmann solar thermal system, in addition to your boiler, the solar panels are also connected to a dual coil hot water cylinder. If the heat from the sun is not sufficient and the water temperature gets too low, the boiler will be fired to heat the water. How much can I save with a solar thermal system? Using a solar thermal system, you could save up to 60% on your domestic hot water energy costs. Is planning permission required for the installation of a solar thermal system? Whilst our solar thermal systems utilise solar panels which will need to be installed on the roof of your home, planning permission is usually not necessary unless your home is a listed building or it is in a conservation area. Why should I choose a Viessmann solar thermal systems? Utilising the highest quality materials, we have been designing and manufacturing solar panels for more than 30 years. Continuously proving themselves in terms of efficiency, performance and reliability, there are more than 1 million Viessmann solar systems installed worldwide. The use of solar energy ranks among the most environmentally responsible energy conversions imaginable. In addition, the government is currently committed to investing in these kinds of systems. Advanced flat-plate and vacuum tube collectors for modern heating systems - Flexible and customised solar thermal solutions for every home. Which Technologies Are Eligible For The Domestic RHI? Learn more about grants and funding for Solar Thermal / Photovoltaic systems.